O ISRAEL! HAVE YOU FORGOTTEN THE PROMISE OF OUR YAH? WHY THEN DO YOU YET HOLD TO TRUST IN VANITIES, the INDISCRIMINATE DIVERSITUDES, CONTENTIONS and WARFARE that is AMONG YOU O ISRAEL, BUT THAT YOU HAVE BEEN LONG SCATTERED AMONG THE NATIONS? (Malachi 3:13-<18-4:5) DO YOU NO LONGER TRUST WHAT IS THE FORETOLD SOLUTION TO OUR PLIGHT? YAH SHALL SURELY MAKE US AGAIN ONE IN HIM! HE SHALL MAKE US AGAIN UNTO THE GLORIOUS PEOPLE THAT FOR HIM WE WERE FOREORDAINED TO BE! HE SHALL HAVE US FOR HIMSELF, A RIGHTEOUS AND GLORIOUS HOLY PEOPLE FOR THE TRUTH of HIS GLORY! Dare we who are rational believe that for all our many diverse and contentious doctrines and divisions that we in all things have escaped the ravages, even blindness behind the invisible walls of arrogance in ignorance that is BABYLON? The MOST HIGH has spoken directly to me saying, “If you can believe that the multitude of diverse contradictions seen in this world are a work after MY Spirit, you canNOT be a disciple unto ME!” They canNOT be a disciple unto YAH the HOLY ONE, who trust in the DOUBLE-MINDED VANITIES and CONTRADICTIONS among the NATIONS! (James/ Yacob 1:1-4>-4, John 14:15-16, 17:9, Ephesians 2:1-<8-10>-4:17) It is NOT under the SPIRIT of THIS WORLD any man may OVERCOME the POLLUTIONS of this WORLD! WE MUST AGAIN SEEK YAH HIMSELF for the FULL REMEMBRANCE of HIS RIGHTEOUSNESS according to ALL that is foretold we should EXPECT by HIS PROMISE for ALL the WHOLE REFRESHING, the PURE RESTORATION, and the RENEWING of OUR STRENGTH! (Acts 3:18-23, Matthiah 5:14-21, 7:13-21, 1Corinthians 3:18-4:5, Isaiah 44:20-45:6>-46:13) Let no man be beguiled by the enticements of worldly flatteries to remain caught in the snares of false pride! Let no man consider himself wise enough before the time when MESSIAH must reveal again ALL the HIDDEN THINGS which MEN have NOT considered! THEN shall every man know again indeed how to PRAISE YAH! As foretold, because of unwillingness to see what indeed is the promises of YAH unto HIS people ISRAEL, there has been much AMBIGUITY distorting the intimate MEANING of the texts as they have been translated blindly among the NATIONS! (Isaiah 29:8-16>-32:8) In this manner have the rulers sought to disguise themselves that you do not see that their DI-visions ie. diversely “divide and conquer visions” are SIN! For till ALL ISRAEL is ONE, speaks no lies and doing no iniquity with none to dissuade .. WE are NOT SAVED .. from the MARKS of BEASTLY NATIONS which REFUSE to see ALL RIGHTEOUSNESS as with ONE REASONING! (Mark 12:29-31) (1Corinthians 3:1-4, 3:18-4:5, .. 2Thessolonians 2:1-<7-12 .. Isaiah ch.11-14) (Zephaniah 3:1-5>-<3:13>-20, Revelation 14:1-12) (Jeremiah 23:1-<5-6>-8) By the Spirit of YAH whereby HE has anointed me, please now allow me to offer you from HIS hand, what I consider an honor to convey unto YOU my people, the insights, a report of HOPE that YAH has granted me for the blessing, even the restoration unto righteous holiness, HIS people! Isa 49:3 KJV And YAH has said unto Me, Thou art MY Servant, O ISRAEL, in whom I will be glorified. Isa 49:4 Then I realized, I/we have LABOURED/ WORKED after VANITIES, I/ we had spent my/our strength for nought, and after VANITIES. And then I said, yet surely My/Our hope for JUSTICE/ RIGHTEOUSNESS is with the LORD, and My/Our REWARD/ WORK/ LABOR shall be with My/Our YAH. Isa 49:5 And NOW, says the LORD that formed Me from the WOMB to be HIS Servant, to bring Yacob again to HIM, Though ISRAEL be not yet GATHERED, yet shall I be GLORIFIED in the eyes of the LORD, and in My YAH shall be My/ Our STRENGTH! 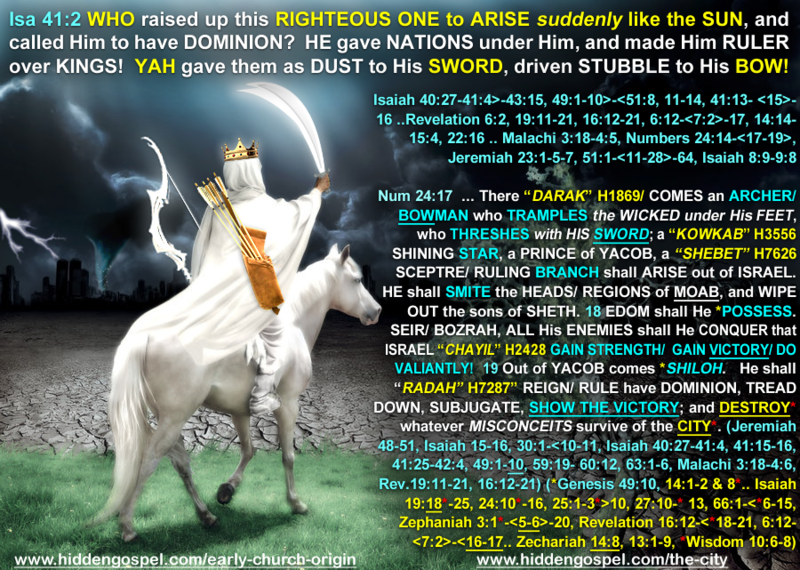 Isa 45:19 I have NOT spoken in SECRET, in/from the dark place of the EARTH: I said NOT unto the seed of Yacob, Seek ye me in vain/ after VANITIES/ CONFUSIONS/PARTIALITIES of the NATIONS: I the LORD speak in RIGHTEOUSNESS, I declare things that are RIGHTeous! Isa 45:22 Look unto Me who is ON HIGH, and be ye SAVED, all the ends of the EARTH: for I am the MIGHTY ONE, and there is NONE ELSE. Isa 42:7 To OPEN the/your BLIND eyes, to bring out the PRISONERS from the PRISON, and them that sit in darkness out of the PRISON HOUSE. Isa 42:17 THEY shall be turned back, THEY shall be greatly ASHAMED, that trust in graven IMAGINATIONS/ VANITIES/ CONFUSION, that say to molten IMAGES, Ye are/ should be our gods. Isa 42:18 HEAR, ye DEAF! and LOOK, ye BLIND, that ye may SEE. Isa 42:19 WHO is/ are the BLIND, but them YOU say are My servants .. whom ye serve? or the DEAF, but My/ YOUR messengers that you say I sent? .. you sent them! WHO is as BLIND as they that say their way is “PERFECT“, and BLIND as the ones YOU presumed were the LORD’S servants? In the MULTITUDES of their so-called “PERFECTIONS” have they only BLINDED to CONFUSE/ RAVAGE MY PEOPLE that NONE who trusted in their IMPERFECTIONS/ UNrighteousness were DELIVERED! Isa 42:20 THEY SEE MANY things, but they observe ME not! They claim to OPEN the EARS, but they HEAR ME NOT! Isa 42:22 But this is a people ROBBED and SPOILED; they are ALL of them snared in HOLES, and they are hid in PRISON HOUSES: they are for a PREY, and NONE DELIVERS; for a SPOIL, and none says, RESTORE. Since ALL have taught UNRIGHTEOUSNESS, NONE is SAVED! A precious word of admonition and blessing is here for them whom YAH has blessed with a heart made willing to receive it! Furthermore, realize the very intricate comparisons between ISAIAH 40-41 and ISAIAH 48:1-<22-49:10, as compared also to ISAIAH 44:20-46:13! What do you CRAVE? Is it a PARTIAL and POLLUTED, or a much more continually GROWING, much more COMPLETE ACCESS unto the EXCEEDING TRUTH of the SAVIOR to indeed KNOW HIM? Discern WHY YEOSHUA said that HE is the ROOT and OFFSPRING of DAVID, even the ONE who was called BRIGHT MORNING STAR, the RIGHTEOUS ONE likened to the RISING SUN who shines out of the EAST to CAST OUT all the DARKNESS, .. and to REVEAL the LIGHT a WHOLE WORLD has sought to OBSCURE! (Revelation 22:16) WHO is that promised “RAVENOUS BIRD likened in HIS BRIGHTNESS to the MORNING STAR of the EAST that shines to cast out the DARKNESS“? WHO is the ANGEL from the RISING SUN? The SUN of RIGHTEOUSNESS that ARISES? (Revelation 7:2-7:17, Malachi 3:18-<4:2>-6) He comes for the REMEMBRANCE of ALL THINGS, to PERFORM ALL that appeases DIVINE PLEASURE therefore to FREE HIS PEOPLE out of the NEGLECTFUL DECEPTIONS and ARROGANCE in the IGNORANCE of FALSE PRIDE that is “MYSTERY BABYLON“! (Isaiah 46:8-13, 40:1-<27-41:4>-42:4 .. Mat.12:18, Isaiah 48:22-49:6, 44:20-45:6, Mal.3:18-<4:2>-4:6, Revelation 7:2, 16:12-21, 22:16, Acts 3:18-23) (Isaiah 66:1-<6-15, 59:12-60:12, 30:1-<8-15) Learn WHO the BIBLE in its FULLNESS says YEOSHUA IS according to ALL that was FOREORDAINED as the PROMISES of YAH! O ISRAEL! OUR PEOPLE, THIS MINISTRY IS IN DEEP NEED OF BEING MADE KNOWN TO OUR PEOPLE! IT IS IN DEEP NEED OF YOUR SUPPORT THAT VERY PRECIOUS WORDS SUCH AS THESE WHICH ARE FOUND HARDLY NOWHERE ELSE MAY BE SUSTAINED AND PUBLISHED ABROAD AMONG OUR PEOPLE, EVEN ALL WHO WOULD BELIEVE WHEREVER THEY NOW BE! GIVE OF YOUR HEARTS, GIVE OF YOURSELVES AS THE SPIRIT GUIDES YOU! FOR THEY WHO BLESS A PROPHET IN THE NAME OF A PROPHET, SHALL NOT LOSE THEIR REWARD! THEIR WORK, THEIR LABOR SHALL NOT BE IN VAIN! Giving all praise to YAh for he is good his mercy endures for ever may the word of Yah really be spreaded world wide so his people will know his name and feel his presence where we can all know we are a very beloved nation of people. Truth , and I agree with this Hidden gospel. Great and anointed teachings, shalom and be bless.